Miss S.M. 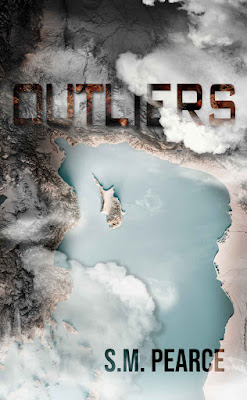 Pearce reached out to me asking if I would be interested in reading and reviewing her debut novel, Outliers. I’m used to asking people to review my books, so I was pretty flattered to be on the receiving end. Plus, it’s YA dystopian, which is my weakness. Naturally, I agreed. Less flattering—getting BCC-ed on an email which asks to ‘submit a book for review.’ When asking for a professional favor, at least personalize your correspondence with my name. But email etiquette is a discussion for another post. Enough stalling and onto the review. Renee and her family live on Mozaan, a large island floating over a now uninhabitable Earth. Some people, including Renee and her friends, have developed special powers. Those with these abilities, the outliers, have to keep them hidden or else a segment of the military known as the Takers will imprison them. When a team of Takers storms Renee’s house, she and two friends narrowly escape while her brother and parents get captured. The trio of teens attempt to keep their powers hidden and survive the best they can, but eventually, Takers catch up with them. They are discarded and thrown (literally) off the island. Miraculously surviving the fall, Renee realizes that Earth’s surface isn’t what she expected, she isn’t the only survivor, and her life is still in danger. Since the author is a teen, I tempered my expectation—particularly because this is her first novel. However, I was blown away by how excellent this book is! The plot is engaging and immediately pulled me in, the settings are interesting and beautifully described, the characters are dynamic and grow through the story, and the pacing is perfect with plenty of action and emotion. Also, the author doesn’t shy away from dark and complex themes, crafting a mature and entertaining story. Only one little detail bothered me. When their parents were taken, the teens assumed their moms and dads had died. Since there was the chance the parents were still alive, I was shocked that the main characters simply assumed their loved ones were dead and never tried searching for them. Everything is addressed by the end of the book, but it bugged me. Although this book is the first of a planned trilogy, there’s a satisfying amount of resolution at the end and a hook for the next couple books. I hope the author keeps working on the series because I’m definitely going to read book two! Anyone who enjoys young adult dystopian, sci-fi, or fantasy will love this novel. S.M. Pearce already shows a ton of talent, and I’m looking forward to following her writing career.